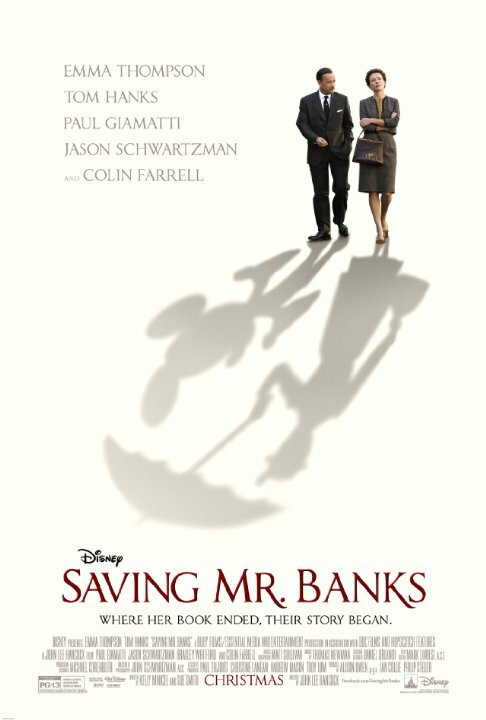 Saving Mr. Banks – Who is saving whom??? Walt Disney: “No whimsy or sentiment!” says the woman who sends a flying nanny with a talking umbrella to save the children. P.L. Travers: You think Mary Poppins is saving the children, Mr. Disney? 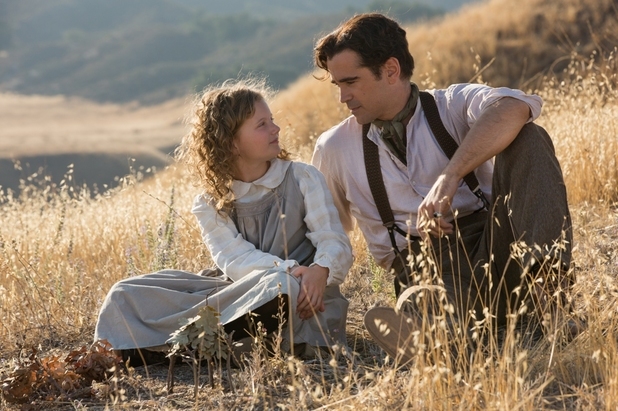 Before going to see this, I was under the impression that Saving Mr. Banks was the life story of Walt Disney. The movie is actually about P.L. Travers, the author of Mary Poppins. Despite the fact that I was confused for the first ten minutes of the movie it was pretty good. The casting was great and Tom Hanks as always, does a fantastic job. P.L. Travers never did warm up to the song “Let’s Go Fly a Kite”, as depicted in the film. According to Richard M. Sherman, it was “Feed the Birds” that actually won her over. The emotional weight of the scene featuring the song “Feed the Birds” is based on the fact that it was Walt Disney’s personal favorite song. According to the real Sherman Brothers, Walt would call them into his office to play the song when he felt depressed. It got to the point that he would call them in and simply say, “Play it,” and they’d know what he wanted. According to Richard M. Sherman, Walt felt that the song was a perfect summation of why he created Walt Disney Pictures in the first place. Tom Hanks said that Disney CEO Robert A. Iger called and personally asked him to portray Walt Disney, especially since the company had not originally developed the script it had acquired, and now wanted to make certain it had someone it could trust to play its iconic larger-than-life founder to move ahead with the risky project. A map of Florida is visible in Walt’s office where the location of what would become Walt Disney World (opened in 1971) is marked. 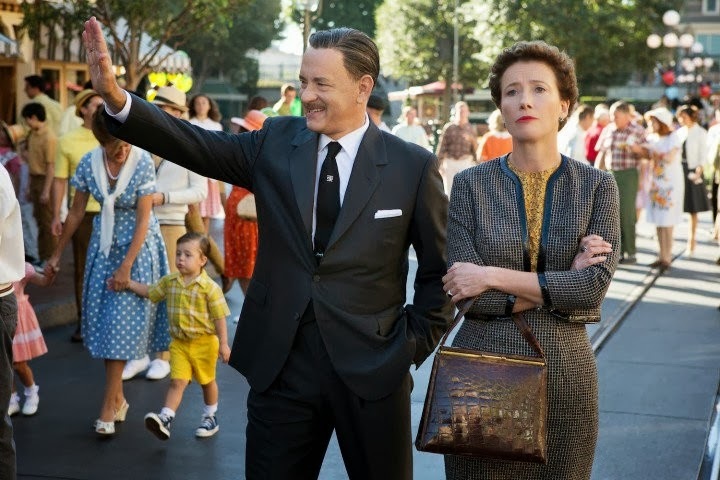 The story of Saving Mr. Banks is told through two perspectives. P.L. Travers, as a child and as an adult. Throughout the movie we are taken back and forth between these two times of her life. The two story lines show us who she truly is and how she was shaped into the person she is now. The story begins in Australia with her playing in a garden, until her father approaches and they go home to pack up and move to the other side of the country. Her father is a story teller, a goof, and loves spending as much time as he can playing with his children. Despite the great relationship they appear to share, something seems amiss. Travers idolizes her father and wants to be just like him, but she doesn’t know his secret, the reason that he can’t hold a job and her mother always seems unhappy. Although he appears to be a good and caring father, he’s an alcoholic. So much so, that if push came to shove, he would choose booze over his family. This story-line shows some of the good moments of her life, but it mostly emphasizes the tragedies, because it’s those experiences that truly shaped her. The other portion of the story shows her adult life. Walt Disney has spent the last 20 years, trying to get her permission to turn Mary Poppins into a movie. She has no interest in doing so, but due to financial problems decided to give it a shot. 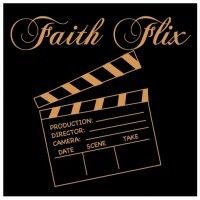 She flies to Los Angles and begins working with a team at Disney to transform her book into a movie production. It during these scenes that we see how much the tragedies of her childhood have scarred her. She very quirky and little things like pears and the color red upset her. From the get go, she butts heads with the team, as their ideas are not all in sync with how she envisions the movie. This causes quite a bit of drama between her and Walt, but in the end they succeed in turning her book into a movie. Not only that, but the process helps her deal with her past. One of the biggest take away points from this story is that pain and suffering we experience in life can be used to help, encourage, and bring joy to others. Travers faced all sorts of difficulties throughout her childhood. In order to cope with the painful memories she wrote the story of Mary Poppins, but in the end she still allows it to influence her life. By the end of the movie, the process of turning her book into a movie, changes her for the good and helps her cope with her past. While discussing this with my wife, I immeditaly thought about the story of Joseph. At an early age Joseph had a difficult life. His brothers hated him, plotted to kill him and in the end sold him into slavery in Egypt. 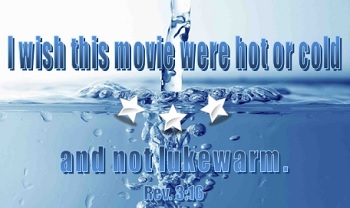 After being bought in Egypt, things go well for a while, but then he is wrongfully thrown into prison. After some time in prison, he gets summoned by Pharaoh and is able to help Egypt through the famine. This is when he is reunited with his brothers and has the power to take out his revenge. But Joseph is not concerned with revenge, he understands the big picture/God’s plan. Despite the pain, suffering, and hardships, Joseph sees how God has used those things for the good of others. His brothers then came and threw themselves down before him. “We are your slaves,” they said. But Joseph said to them, “Don’t be afraid. Am I in the place of God? 20 You intended to harm me,but God intended it for good to accomplish what is now being done, the saving of many lives. 21 So then, don’t be afraid. I will provide for you and your children.” And he reassured them and spoke kindly to them. Although the picture above only shows 3 stars, I would give this 3.5 out of 5 stars. The movie is very well done and the acting is great. During most of the movie I really disliked P.L. Travers character. She seemed unreasonable and difficult, but once I began to understand where she had come from, my dislike turned into sympathy. The movie does a good job of manipulating your emotions and making you care about Travers. There are some sad moments, happy moments, and funny moments. Overall, both my wife and I liked the story and would recommend at least renting it, if not seeing it in a cheap theater. Good review Elliott. Though I will admit that this flick wasn’t perfect, it was still a lot better and more emotional than I expected it to be. Especially when those final minutes came on screen and had me welling up quite a bit. Agreed. The end was the better part of the movie. I read some information after seeing the movie and apparently she never approved of the movie. So it seems like they stretched the truth for the movie. Which sort of leaves a bad taste in my mouth… Thanks for commenting! Good review, Elliott. I liked your trivia notes and the background in there.